Clusters make for particularly striking displays. It’s time to add color and excitement to next year’s garden – by purchasing and then planting spring-flowering bulbs. These practically fool-proof plants will add delightful blossoms from the time the first crocuses and scilla pop up in March, often coming up through some snow, until the ornamental alliums produce their bright globes in mid-summer. My favorite attribute of spring-flowering bulbs is that they are add excitement without having to replace any plants already growing in the garden. The bulbs can be planted under shrubs, right beside established perennials or intermixed with other bulbs. 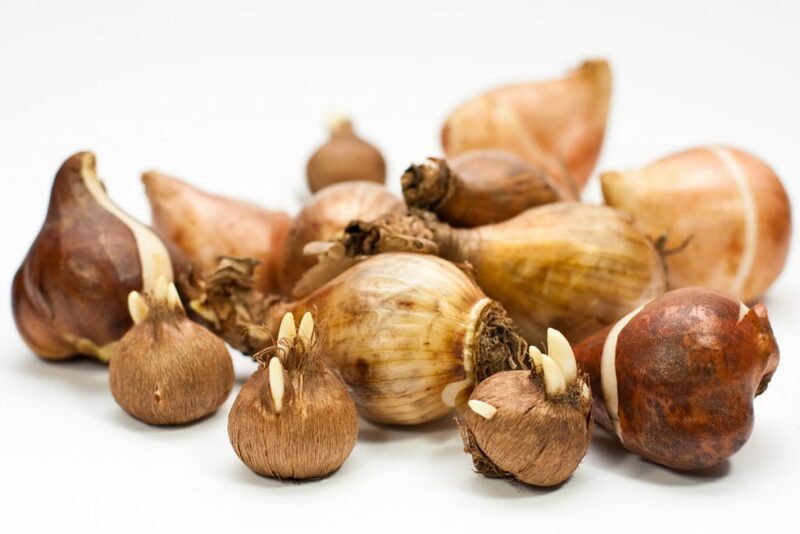 All fall-planted bulbs are treated about the same way. They should go into the ground between now and the end of October, although I have stretched it into November without problems. It is better to plant bulbs that deer and rodents like to eat, such as tulips, later in the season because that gives the critters less time to get to them before the soil freezes over. The rule of thumb is to plant them two or three times as deep as the bulb is tall, but deeper is better. The deeper the bulbs are planted, the less likely they are to be eaten or damaged by you as you work in your garden. Lisa Colburn, author of The Maine Garden Journal, said in a talk to the Cape Elizabeth Garden Club that she recently added a raised bed to her Orono garden. Instead of removing the daffodil bulbs that were in that spot, she created the beds right on top of them, adding about 18 inches of soil. “The daffodils came up the next spring, and looked better than ever,” she said. So, planting them deeply will cause no harm – and it probably will help. Loosen the soil at the bottom of the hole, so the roots will have less resistance when they begin to grow. It also helps to add compost to improve the soil and some fertilizer, one with more phosphorous – the middle of the three numbers on the package – to promote flowering. When we first planted bulbs on our property 40 years ago, we put bonemeal in with the bulbs. That is no longer recommended, and we haven’t used bonemeal for 25 years. The smell will attract rodents and deer. And Colburn said studies have found that bonemeal interferes with mycorrhizal fungi, which help bring nutrition to the roots. Now, we get into design. The simplest advice is that more is better. A single daffodil or tulip will look good, but it won’t attract much attention. And a line of flowers is too static and formal. If you can’t bring yourself to plant in masses, try doing a zigzag line. The best idea is to create a mass of bulbs. If you put five bulbs in an area about a foot in diameter, it will be a splash of color in a bed. If you place several groupings of five bulbs in different spots in the garden, it will create a eye-catching rhythm. Or you could create a mass of bulbs over a wide area – all the same or mixed, depending on your taste. While it would be pricey and a lot of work to plant 10,000 bulbs in a single year, a lot of them would look good in a mass. There are hundreds, if not thousands, of varieties. They come in yellow and white, many have showy double flowers while others have a different colored cup in the center. And they come in different heights and flower size. Because all parts of the plant are poisonous – although not fatal for humans – deer and rodents leave them alone. Tulips are the other popular choice and come in a wider range of colors (including stripes), heights and flower shapes, including some that look like peonies. Some bloom as early as April, while others will come out in June, so you can extend the season. And tulips will “perennialize” (bloom for years to come) if you plant them deeper than the label instructions say, in a place that does not get watered during the growing season. Yes, a dry droughty spot is what they like after they bloom. Hyacinth used to be among the most popular bulbs, but they have gone out of favor in recent decades. They have outstanding fragrance and work especially well along walkways and home entrances. They have huge spikes of flowers, ranging from eight to 12 inches high, and come in a range of colors, including yellow, pink, peach, white, purple and an almost true blue. It is perfectly OK to mix the bulbs. In fact, if taller and shorter bulbs are planted in the same patch, it creates a layered look that is striking. Ornamental alliums are also pest-proof bulbs, and I covered them in a short item last week, so I will skip them here. A more unusual bulb is fritillaria, which has blossoms that hang down in masses and prefer filtered sunlight over full sun. It will naturalize and develop baby fritillaria bulbs in your garden. Two smaller, naturalizing bulbs are scilla, often called wood squill, and muscari, also called grape hyacinth. Both work well in lawns, and their diminutive size does especially well in rock gardens. Colburn had one interesting tip for muscari. Once it is established in the garden, it sends up leaves in the fall. So, if you plant some with your other bulbs when planting this fall, in future years you will know where you have planted bulbs previously because the muscari foliage is there starting in late August. This prevents one of those “uh-oh” moments when you are digging a hole for new bulbs and find that you have accidentally sliced through an established bulb. And who wants to destroy something that can provide so much beauty.